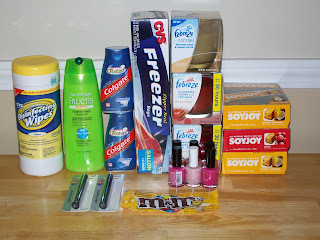 Frugal & Fabulous: I love CVS! Glade candles & free makeup!!!! I love CVS! Glade candles & free makeup!!!! 3 - Rimmel Nail Polishes (clearanced to $.87) used three $1/1 MFCs = -$.39! Paid with $14.59 in ecbs and $.49 oop! 2 - Febreeze Candles (clearanced to $1.99)used two $2/1 MFCs from 12/14 P&G = FREE! I just ran there tonight just for the candles.. totally forgot about the soy joy bars! doh! Nice job! I'm going to have to go check for the nailpolish. Are your $3 off a CVS purchase coupons really small? I've tried zooming in and printing them, but they just get blurry and look fake. & I've been too nervous to use the small ones because they look like they won't scan. doncha hate it when they won't adjust the ECBs?? they never want to anymore! i'm going to look for some rimmel.....have a ton of those Qs around here somewhere that i almost forgot about! laurie i haven't had any of them scan at "our" local stores but they haven't been rejected either.